The collection of the nation’s top high school baseball athletes will converge on Wrigley Field in Chicago on August 15th for the Under Armour All-America Game, powered by Baseball Factory. Now in its eighth year, the game is the definitive gathering of baseball’s elite. It is the launching ground for athletes to be noticed, highlighted by a formal workout for Major League Baseball (MLB) scouts and a homerun derby, all while under the tutelage of some of the game’s best players and coaches. Today we highlight one of the players who will participate in the All-America Game, left-handed pitcher, Jonathan Gettys. 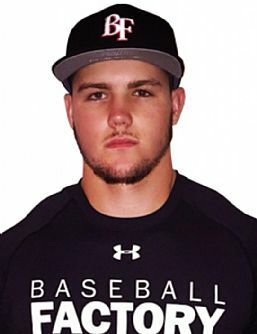 Gettys, a native of Gainesville, Georgia is a junior at Gainesville High School and has committed to pitch for the LSU Tigers. Baseball is in the blood of the Gettys family as his brother, Michael, played in the 2013 All-America Game and was drafted by the San Diego Padres in the second round of last year’s MLB Draft. With his arm, Jonathan led Gainesville to the Georgia Class 5A State Championship Series and had an incredible season, going 12-3 with an 0.85 ERA and 131 strikeouts in just 82 1/3 innings. The Red Elephants lost in their three-game series against Greenbrier High. Gettys recently shared his insights in a conversation with Baseball Factory as he prepares to showcase his talents in the Windy City. Baseball Factory: How exciting is the opportunity to play in the Under Armour All-America Game, the same showcase that your brother Michael once played in? Jonathan Gettys: It’s really exciting. My brother said it was a lot of fun and the experience was amazing. Wrigley Field is a great place to play and I’ll be able to see the city. It is a great opportunity for me. BF: Playing in Wrigley Field… that has to be quite the thrill..
JG: It’s going to be really fun. The best part is that it will be on TV, so everyone will be watching, scouts will be watching. We will be facing really good competition from around the country, good hitters. I will have members of my family and my girlfriend there as well, so I am looking forward to it. BF: Describe the relationship you have with your brother Michael..
JG: We have a pretty good relationship, when we would both be playing in games, we were a good combo. We’ve always worked out together (he’s the cut guy) and have played a lot of sports together. BF: In addition to your arm on the mound, you’ve done pretty well with the bat this season, haven’t you? JG: Yeah, I’ve done well with the bat. I hit 13 home runs this season, which I think, is second best in the country. BF: You recently threw a no-hitter for your travel team (Team Elite Roadrunners). What was your favorite moment of that happening? JG: I definitely wasn’t expecting it. It was early in the morning when we played, but I went out there and executed my pitches. My favorite part of that day was that I was able to strike out 15 batters. BF: Why did you choose LSU to play baseball? JG: I really liked it there, the facilities are super nice and I really enjoy Cajun food… The fans there are great and so is the atmosphere. LSU is always in the Top 10 in baseball, so its a great school to go to because they win. BF: If you weren’t playing sports, what do you think your career path would be? JG: I think a weight and strength conditioning coach so that I could help kids become better athletically to help them with their game. BF: Which major league hitter would you most want to face right now and why? JG: Definitely Mike Trout. He can do it all. You can’t make a mistake against him, because he’ll make you pay. He would definitely make me a better pitcher by having faced him. JG: Clayton Kershaw. My curveball is kind of like his, I’ve heard people compare my curve to his. He sits at mid 90’s with his fastball with great location. I definitely want to have the ability to locate my fastball like Kershaw’s.